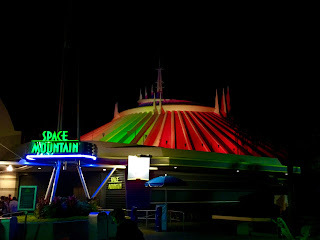 Space Mountain is a classic Disney attraction that is only about a month away from its 40th birthday. For the most part, the exterior of the "mountain" has remained largely unchanged since 1975. However, during Mickey's Very Merry Christmas Party, it is illuminated with red and green light. I snapped this shot on Sunday night while walking through Tomorrowland.